Guide-it™ SNP Screening Kit는 CRISPR/Cas9 시스템으로 생성된 단일 염기 치환 (Single-nucleotide substitutions)을 신속하게 검출할 수 있도록 제작된 제품이다. 기존의 시퀀싱 분석을 이용한 SNP 검출법에 비하여, 본 제품을 이용하면 보다 빠르고 쉽게 치환부위를 확인할 수 있다. 타겟 유전자 부위 (유전자편집 부위)를 PCR 증폭하고, 구조 특이적인 핵산분해효소 (Structure-specific endonuclease; Flapase)를 처리하면 단일 염기치환이 있는 경우에는 형광을 발하게 된다. 본 방법은 치환되는 염기의 종류나 유전자의 위치, Edited clone의 zygosity에 관계없이 단일염기치환 부위를 검출 가능한 방법이다 (제품 원리 보기). 단일염기치환 (Single-nucleotide substitutions)은 유전자편집의 가장 강력한 적용실험 중의 하나로써, 질병과 관련된 특정 유전자의 SNP (Single-nucleotide polymorphisms)를 모방하거나 정확한Knock-out을 얻기 위한 stop codon을 생성하는 등의 여러 분야에 적용된다. 하지만, 하나의 단일염기치환을 위하여 수백 개의 클론을 스크리닝하는 것과 특히, 유전자치환이 표현형으로 나타나지 않을 경우 스크리닝은 어려운 과제로 남아있다. Guide-it™ SNP Screening Kit를 이용하면 수백개의 클론으로부터 빠르고 간편하게 단일 염기 치환 (Single-nucleotide substitutions)을 검출 가능하다. 그림 1. Schematic of the Guide-it SNP Screening Kit workflow. 그림 2. 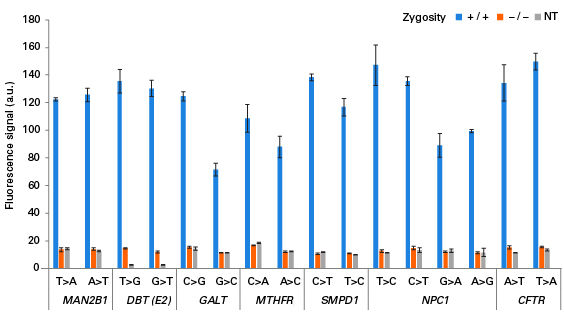 Comparison of SNP screening assay results obtained for homozygous, heterozygous, and wild-type cell samples. The Guide-it SNP Screening Kit was used to assay for each indicated substitution in samples that were homozygous, heterozygous, or wild-type. For each case, fluorescent signals obtained for homozygous and heterozygous samples (blue bars and purple bars, respectively) were of comparable value. 그림 3. Using the Guide-it SNP Screening Kit for genotyping. Samples from the Coriell Institute carrying SNPs at either of two genomic loci (NCP1 or CFTR genes) were analyzed using the Guide-it SNP Screening Kit (graphs) and by Sanger sequencing. Panel A. Analysis of NCP1. 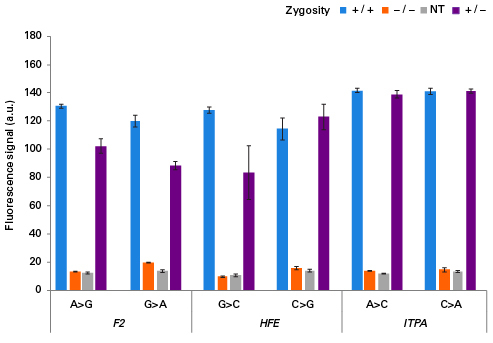 The analysis determined which samples were homozygous or heterozygous for an A>G substitution by employing two flap-probe oligos in independent assays designed to detect either A or G. Panel B. 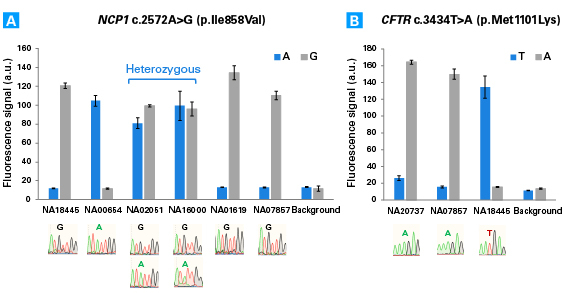 Analysis of CFTR. Analysis of samples that were either wild-type or homozygous for the indicated T>A substitution. All results were confirmed by Sanger sequencing (results shown below the graph under each sample). 그림 4. Detecting nucleotide substitutions in several human genomic loci using the Guide-it SNP Screening Kit. Genomic DNA samples (obtained from the Coriell Institute) which were either wild-type or homozygous for the indicated substitutions were analyzed using the Guide-it SNP Screening Kit. All substitutions were successfully detected, as demonstrated by the strong fluorescent signals obtained for samples that were homozygous (blue) for the indicated substitutions relative to signals obtained for wild-type (orange) and negative control (gray) samples.